We’ve been doing NJ wedding photography for a long time now, so we know how much attention parts of the day like the ceremony and reception tend to get. However, you can never underestimate the importance of the cocktail hour to your overall wedding day experience, even it’s literally only an hour. So, we thought we’d put our experience in the business to good use and pass on a few tips and tricks we’ve picked up along the way to pulling off a cocktail hour that your wedding guests will never forget. 1. Consider your options, and your guests’. You obviously want to serve finger food during your cocktail hour as the bigger meal will be served later, but the thing is that at some weddings, dinner won’t be coming until much later. That’s why it’s so important to be very picky about which finger foods you serve during your cocktail hour so that every guest can refuel if needed. For instance, some of your and your partner’s guests may be allergic to certain foods while others may be vegetarian or vegan, and then there are the drinks to consider. Yes, you’ll likely want to serve plenty of cocktails during your cocktail hour, perhaps even one or two signature drinks, but you should also provide some non-alcoholic options. The point is that the cocktail hour isn’t always just a break from the more formal parts of the wedding celebration; it’s also a chance for you and your guests to refuel and reset. So, make sure you have a menu that allows each and every guest to do just that. 2. Don’t wait to start entertaining. Whether you’re having a band or DJ at your reception or you’re going another route with your entertainment, that doesn’t mean that you have to wait until your reception actually begins to start entertaining your guests. Your cocktail hour can be the perfect time to kick things off and start setting the tone that way. That could simply mean having your band or DJ start doing their thing during that time, if that’s possible and reasonable for them of course, or you could set up some type of game or activity, whether it’s something you can do indoors like a photo booth or an outdoor lawn game such as horseshoes or corn hole. For some more ideas, check out this post from The Knot, 18 Ways to Make Your Cocktail Hour More Fun. The best part about this move, though, is that it’ll go a long way toward getting those guests who don’t know too many other people or who just aren’t so good in social situations to start letting loose and having fun. The more people you can get to start doing that early on, the better your celebration will be later. 3. Plan the seating & serving situations extra carefully. Most cocktail hours require some standing and that’s okay, but it’s always a good idea to have chairs and tables for guests, and yourselves, as well. Think about it, you want everyone to be able to relax and start chatting with other guests during this time, and giving people the option of sitting at a table will only help. On top of that, though, you also need to consider guests who simply may not be able to stand for extended periods of time. You don’t want to force them to have to head away from the party to the reception space early just so they can take a seat, and then there’s the line situation to think about as well. Sometimes just standing on a very long line can be difficult for some people, not to mention the fact that super long lines tend to frustrate almost any guest. So, rather than having all your food and drinks being served from one place, you should consider spreading out the stations around the space. 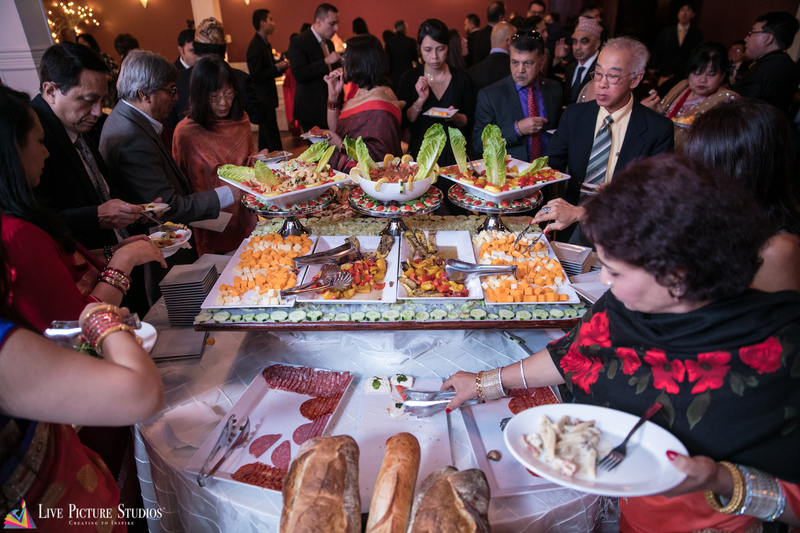 You can also have the servers move around the room or space with trays of drinks and food, or they can hand drinks to guests as they enter to ensure everyone gets one. Hiring plenty of bartenders and servers will also help, but the bottom line is that you don’t want to create a recipe for extra long lines during your cocktail hour. We’ve experienced some unforgettable cocktail hours in our time in wedding photography in NJ. However you do it, just try to remember how much an awesome cocktail hour can do for your wedding day. It deserves the same kind of attention and enthusiasm as any other period of the celebration, and it’ll go a long way toward setting the tone for the party to come. We hop these tips help you pull an awesome one off. Good luck! About Us: Live Picture Studios has been doing NY / NJ wedding photography and videography for years. At LPS, we always create to inspire, and you can check out our photo gallery and video gallery to see some examples.